Rajasthan is not only regal in cultural and heritage but also rich in spiritual point as well. The tour – Spiritual Rajasthan is organized for the tourist who wants to have pilgrim tour to Rajasthan, which consists of major pilgrim spots in Rajasthan i.e. Jaipur, Pushkar, Jodhpur, Mount Abu and Udaipur. Jaipur has many famous temples; some of them are Govinddevji, Galtaji, Motidoogri. In Pushkar one can see the Brahma temple. The temple is one of very few existing temples dedicated to the Hindu creator- God Brahma in India and remains the most prominent among them. Rajasthan tourism also takes you to the destinations like Jodhpur, mount Abu and Udaipur also hosts numerous temples dedicated to Hindi Lords. 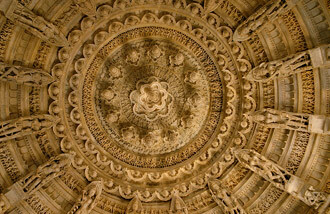 There are many famous Jain temples also, which are rich in their magnificent architectural exertion. 9 Udaipur(Drop) Morning breakfast in hotel Check out from hotel Drop to airport/railway station for onward journey. Hotel accommodation on a twin-sharing basis with breakfast. Travel through the entire journey in an air conditioned car. Mineral water bottle per day Complimentary. Air fare / train fare . Expertise of personal nature such as tips, telephone calls, laundry, liquor, Insurance etc.